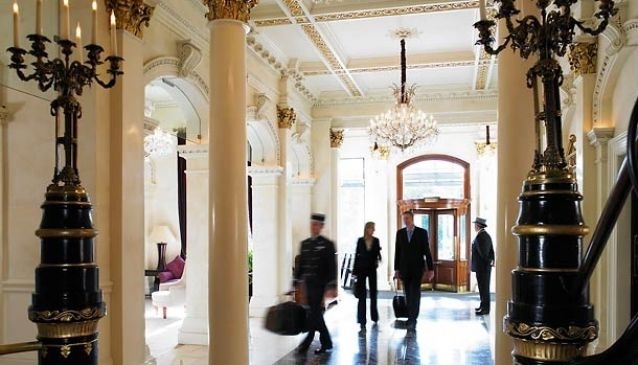 Self-styled 'the best address in Dublin' since it came into being in 1824, the luxury 5-star Shelbourne Dublin (a Renaissance Hotel) is located on St Stephen's Green North, traditionally the most fashionable side of the Square. Dubbed 'Beaux Walk' in the 18th century in recognition of the dandified well-to-do frequenters of the area, this is still one classy stretch of street. In addition to being alongside Dublin's most imposing and well-known garden square, with The Shelbourne as your base you're moments away from Grafton Street, The Gaiety Theatre, Trinity, The National Library, National Museum of Ireland (Archaeology and Natural History branches) and The National Gallery, plus a host of restaurants, pubs and shops. At this grande dame of Dublin hotels, there's unsurprisingly no small amount of historical interest too. So much so that The Shelbourne even has its own Shelbourne Museum near Reception. One notable highlight: in 1922 the first constitution of the independent Irish state (Constitution of the Irish Free State or Saorstát Éireann) was written at The Shelbourne Hotel by a committee under the chairmanship of Michael Collins. You might like to scroll down to the photo gallery below and have a look at an archive photo. Perhaps you're more interested in history as it relates to you (and your family) in particular? The Shelbourne offers a unique Genealogy Butler service, giving you the opportunity to trace your ancestors in Ireland and uncover your family's heritage. You'll be guided by a qualified and experienced professional genealogist, who can take you on a fascinating journey into the past. Naturally, The Shelbourne Hotel offers fabulous facilities. Located over three floors, the splendid Spa at The Shelbourne offers a Health Club with a swimming pool, thermal facilities, state-of-the-art gym, fitness suite, a range of fitness and alternative exercise classes and a dance studio - all professionally run by a team of fully qualified personal instructors. The Spa also provides a range of specially created treatments, each designed to float you away on a fluffy cloud of utterly pampered serenity. For dining close to home, The Saddle Room at The Shelbourne is a modern steak and seafood restaurant with stunning contemporary decor - an 'old favourite reinvented'. The Saddle Room also features two private dining rooms (The Martyn Turner Room, with the cartoonist's original prints, and The Trophy Room featuring 1950s jockey silks). In The Lord Mayor's Lounge a perfect combination of comfort and glamour create an ideal venue for a traditional Afternoon Tea, and you might even spot a well-known face or two as you're sipping away, pinkie extended skyward. No 27 Bar & Lounge is the place for stylish, sophisticated fun. There's a choice of light dining options, classic bar favourites and fresh Irish seafood, plus world wines by the glass, premium spirits and No 27's famous signature cocktails. To top it off, No 27 also serves a Sunday Brunch with live jazz. Finally, raise a glass in a place that's hosted many legends and luminaries in its time with a visit to The Horseshoe Bar. Frequented over the years by politicians, authors, musicians, actors, sports stars and such, if these rich red walls could talk - they'd have plenty to say.